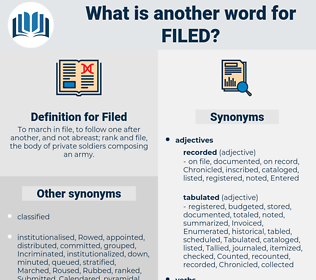 What is another word for Filed? To march in file, to follow one after another, and not abreast; rank and file, the body of private soldiers composing an army. petitions, filing, Filings, enquiries, Inquiries, seeks, releases, Queries, presented. 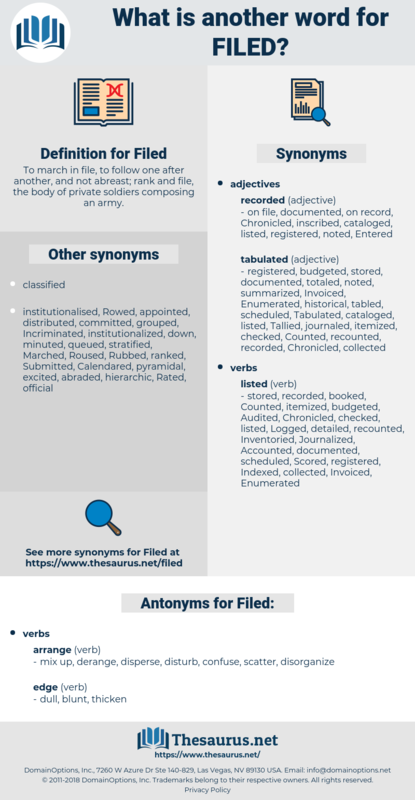 Testified, Fielded, filled, finalized, implemented, assembled, lay, Issued, Participated, qualified, table, tables, handled, identified, forward, fulfilled, Attributed, Referred, classified, Invoked, Delivered, Forwarded, declaration, illustrated, Appealed, Complained, official, Displayed, circulated, initiated, terminated, Pertained, subscribed, Explained, briefed, contained, dismissed, removed, cancelled, articulated, disclosed, finished, Commodities, represented, left, Began, exhibit, Exhibited, Transferred, outline, outlined, Inserted, fed, executed, Wrote, Claimed, established, constituted, confiscated, Deployed, Indicated, developed, elevated, Explored, concentrated, Yielded, distributed, processed, Suffered, characterised, reported, unveiled, Progressed, suggested, recovered, alleged, nominated, enrolled, involved, Commenced, lodge, Lodged, Encompassed, Lived, transmitted, present, Presenting, required, Enumerated, published, manufactured, invited, organized, listed, summarized, Arrived, reproduced, recalled, instructed, included, found, Notified, increased, pledged, Performed, considered, seised, demonstrated, informed, applied, failed, Responded, addressed, restored, realized, Examined, Proceeded, propose, proposed, Emitted, credited, retained, Rendered, Envisaged, experienced, declared, supported, Leveled, Levelled, Communicated, Appeared, products, Recruited, organised, Contributed, derived, Floated, format, seized, advised, described, featured, mailed, Enshrined, imposed, Demanded, surrendered, queued, Contended, furnished, Sued, inscribed, revolved, formulated, Questioned, Indicted, highlighted, commissioned, Flew, postponed, Adduced, enquired, expanded, led, signified, endorsed, taxation, Shelved, Incurred, Cited, Embarked, Inquired, Mentioned, arranged, showcased, Drafted, encouraged, pursued, Told, accused, asserted, loaded, offer, recommended, expressed, promulgated, prepared, Arose, Remitted, Convened, statement, opposed, traveled, travelled, dispatched, Consisted, directed, Offered, produit, Objected, centered, engaged, drove, signalled, related, Channelled, appointed, Undertook, maintained, open, opened, Instituted, Gave, office, Achieved, Came, Classed, rejected, understood, charged, pronounced, exposed, enhanced, moved, relayed, defeated, concerned, committed, Entered, released, welcomed, saw, placed, spoke, Transported, Emerged, Argued, Encountered, contracted, Discussed, Tendered, sponsored, upgraded, Assessed, extended, attended, provide, Provided, donated, Enacted, posed, governed, Supplied, Summoned, assumed, ordered, product, struck, joined, satisfied, tested, Dealt, conveyed, noted, conducted, Helped, Captured, form, hired, pointed, Was, Were, planned, built, Became, Caused, spent, return, Returned, Occurred, faced, attached, Tended, announced, set, voiced, staged, Launched, Totalled, promised, contacted, taped, advances, Wore, advanced, earned, Worked, Surveyed, Urged, closed, mandated, broadcast, Wished, Approached, signed, Rated, Looked, formed, Visited, needed, played, centred, graded, held, pressed, Quoted, paid, heard, added, Ranged, covered, let, Happened, Resulted, jacked, Hoisted, Shipped, handed, started, Served, Brought, cast, touched, goods, turned, headed, Toured, formula, focused, focussed, shared, showed, grasped, Waged, Carried, Passed, Pushed, Wondered, gripped, Accounted, attempted, Grabbed, Took, taught, dropped, kicked, broke, eased, bore, Went, drew, won, kept, Met, Stood, ranked, dumped, Awarded, plotted, pulled, Hoped, Gained, Boosted, Stayed, Had, packed, none, said, cashed, stated, called, posted, Amounted, tried, wanted, put, Got, ai, Ran, dated, Did, DO, Meant, Acted, presented. Profiled, available, documentation, classifiable, Compiled, Fielded, preferred, filled, filled-in, declarations, classification, rescheduled, institutionalized, complaint, certification, implemented, assembled, commercialized, issuing, Issued, Participated, reimbursement, Retrieved, settled, mainstreamed, categorized, detailed, handled, identified, Investigated, fulfilled, correspondence, incorporated, Attributed, Referred, collected, classified, Invoked, Delivered, Forwarded, declaration, Replicated, illustrated, scheduled, Appealed, Complained, utilized, documented, documents, Displayed, circulated, specified, initiated, terminated, Prosecuted, discontinued, cultivated, deadline, Interposed, smuggled, subscribed, Explained, briefed, contained, dismissed, removed, reintroduced, articulated, labelled, disclosed, doubled, finished, itemized, formalized, proprietor, evaluated, prioritized, reoriented, represented, Administered, left, restricted, depicted, obligated, characterized, Installed, Exhibited, Transferred, written, withheld, reflected, categorised, solicited, outlined, Inserted, Begun, fed, Resided, executed, deferred, Availed, Claimed, distinguished, Reimbursed, delineated, established, referenced, constituted, Incomes, Extracted, Forgiven, split, confiscated, Deployed, Trafficked, Indicated, inherited, developed, Explored, Disseminated, concentrated, Yielded, accumulated, located, distributed, processed, selected, characterised, checked, calculated, reported, election, witnessed, Accommodated, unveiled, Progressed, suggested, retabled, disciplined, recovered, localized, inclined, alleged, summarised, recourse, nominated, elapsed, allocated, enrolled, involved, formalised, sustained, Commenced, Lodged, Proffered, Lived, transmitted, Tabulated, accomplished, required, Disbursed, Enumerated, published, manufactured, invited, Collated, organized, designed, Plated, retired, listed, summarized, populated, Arrived, gathered, reproduced, Detained, Queried, instructed, motivated, revealed, included, found, Notified, separated, Waived, increased, proceedings, pledged, Performed, input, considered, seised, demonstrated, applied, Followed, Comprised, failed, addressed, underlain, restored, realized, Challenged, Examined, Criticised, reviewed, proposed, Emitted, credited, suspended, retained, Rendered, obliged, experienced, declared, regulated, Billeted, affected, assigned, Levelled, Communicated, recognized, Appeared, products, Recruited, structured, organised, elaborated, Contributed, derived, dedicated, delayed, Relied, Operated, accompanied, combined, seized, lowered, uploaded, intended, described, featured, formatted, conserved, mailed, deducted, Enshrined, imposed, Demanded, surrendered, deprived, approved, preserved, furnished, Sued, connected, inscribed, Indexed, designated, formulated, Questioned, Indicted, highlighted, planted, commissioned, Enjoyed, subdivided, postponed, Adduced, expanded, led, Appended, signified, endorsed, ordinance, Devised, Logged, employed, Exercised, Afforded, emphasized, Incurred, Cited, Embarked, determined, accepted, embedded, Mentioned, Exerted, disposed, arranged, showcased, divided, Drafted, encouraged, enclosed, Viewed, Arisen, Advocated, pursued, solved, conditioned, Told, Consulted, composed, accused, asserted, invested, loaded, Screened, recommended, expressed, renewed, equipped, refunded, situated, prepared, Evolved, Remitted, Convened, statement, opposed, entrusted, traveled, travelled, reopened, dispatched, used, driven, Adjourned, detected, directed, billed, Offered, learned, Undertaken, expended, centered, embodied, portrayed, Levied, packaged, engaged, given, signalled, related, Channelled, appointed, desired, Constructed, Repealed, maintained, opened, saved, Instituted, ground, office, Achieved, exchanged, heralded, measured, Classed, case, resort, Resorted, understood, Spilled, forged, enter, charged, expected, Disarmed, pronounced, prescribed, exposed, seen, spoken, moved, concluded, monitored, concerned, discharged, oriented, committed, Entered, released, Adhered, programmed, placed, devoted, Transported, Emerged, framed, Argued, condemned, Encountered, come, contracted, educated, adjusted, subsumed, Discussed, Tendered, Regarded, observed, sponsored, Annexed, stored, rolled, Targeted, upgraded, sub-mitted, effected, Undergone, defined, sold, dictated, risen, Denounced, Tempted, Assessed, practised, researched, extended, attended, graduated, Provided, donated, Enacted, Complied, guided, posed, governed, Supplied, assumed, honoured, Upheld, chosen, ordered, Impounded, struck, joined, fostered, deposed, satisfied, positioned, tested, Dealt, conveyed, noted, conducted, Captured, returns, painted, CODED, Marketed, hired, pointed, treated, built, Caused, spent, Returned, damaged, Occurred, Deemed, scope, grown, faced, shaped, attached, action, Tended, phased, worn, Couched, announced, set, motion, trained, voiced, aired, Launched, promised, contacted, taped, Reposed, vested, advanced, earned, Worked, Been, Surveyed, Reached, Urged, Subjected, contested, closed, Judged, forced, mandated, trimmed, broadcast, Ushered, Approached, signed, Rated, Looked, formed, Propounded, played, centred, graded, Shown, held, crafted, poised, induced, pressed, Quoted, granted, paid, heard, bid, routed, tax, added, mounted, covered, staffed, authored, secured, Promoted, Happened, Resulted, spread, Poured, bound, Shipped, Warned, handed, started, Served, Brought, cast, groomed, proved, proven, Slotted, Housed, touched, Tasked, thrown, changed, turned, headed, focused, focussed, shared, grasped, respected, Waged, Carried, Passed, landed, Pushed, Farmed, Accounted, broken, born, Borne, Grabbed, drawn, taught, dropped, gone, Scored, geared, Phrased, kept, Met, Stood, ranked, dumped, taken, papers, Awarded, founded, have, Has, stocked, trapped, controlled, Stayed, Had, packed, grouped, studied, versed, said, stated, Counted, marked, called, posted, sorted, Worded, tried, based, put, Got, run, dated, done, shed, Meant, Acted, named, presented. derange, mix up, disorganize, disturb, confuse, disperse, scatter. You filed a claim this mornin' in his name. His brothers filed out of the room.